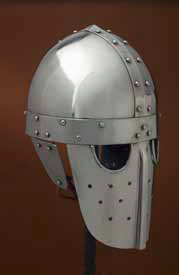 This helmet is a simplified adaptation of the Valsgarde Vendel Era helmets. This variation features the typical rounded crown and central ridge reenforcement, however the subtle point topping the crown adds a distinctive deflective touch. While the half circle eye holes follow the 'spectacled' upper face guard, this elongated versions provides full face protection while offering breathing holes. The side ear flaps are hinged. Although less ornate than the Valsgarde helmets this version does offer the rugged intimidating feel of a Viking era helmet. This page was last modified on 26 October 2013, at 18:18.